Rob's off to a rock concert and Feifei's not been invited. She's not happy, especially because she thinks she's got 'FOMO'. Find out what this means and if FOMO is an illness of the body or the mind. But don't worry, Feifei's FOMO won't last long! And hello, I'm Feifei. We're here to teach you a real English phrase… Rob, what's that you're holding there? Oh this… just a ticket to see one of my favourite rock bands in concert – The Rolling Thrones. Oh great – and I see you've got more than one ticket. Yes, that's right, a few of us from the office are going – it's tonight! I'm very excited. [SOUNDING JEALOUS] Oh right – Rob, it sounds fun - maybe I could get a ticket and join you? Why? You don't like rock music and you always stay in and wash your hair on a Thursday – or so you tell me anyway. Oh Feifei, you've got FOMO. 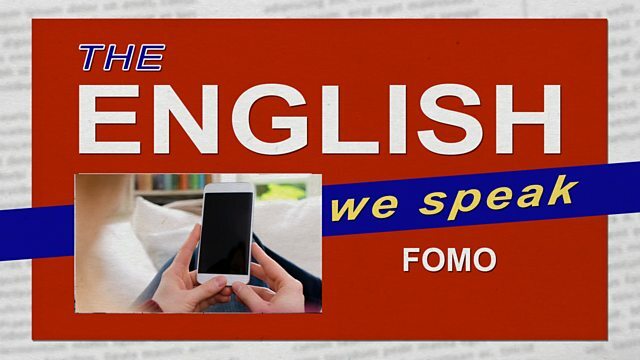 I've got 'FOMO'? Is that bad? Is that why you didn't invite me? Oh dear, should I go and see a doctor? No, don't see a doctor. FOMO is an acronym for 'fear of missing out'. It's a worried feeling you have that other people are doing fun things when you are not – you're missing out! I know Martha's got FOMO, she's been moaning about not being invited to Wang's karaoke party – but she doesn't even like karaoke! All my friends are going on holiday together but I can't afford it so I've got FOMO. There's a message on Facebook that all the tickets to that gig are sold out – now I have a feeling of FOMO! So that's FOMO – fear of missing out – which describes a feeling you might have when you feel other people are doing something fun, when you are not. Well Rob, now I know what it means, I know I haven't got it. I just wanted to be sociable, and have some fun with you all. Sorry Feifei, even if you could get a ticket, it's boys only I'm afraid. Oh look, I've got a message on my social media feed… is the lead singer of your band called Mick Dagger? That's him – the finest rock singer around – why? It says here, he's fallen down the stairs and broken his leg. The rock concert is cancelled! Cancelled? Oh no. Err, what did you say you were doing tonight? Any chance I could come round… watch a movie, get a takeaway? Oh dear Rob. Have you got FOMO now? Bye.